Are you building a summer home for us? Roof Shingles - Ridge Cap? National Archives - Pay dirt! There was a flurry of train orders for 6 Feb, 1863 when the Locomotive Fury derailed on a broken rail. According to the message traffic it took three other locos to pull it back on to the track. Here are some of the telegraph messages (some are train orders) from that day. The Victor, Wentz, Osceola and Leach are other USMRR locomotives on the Aquia Line at the time. Note that many messages are addressed, W.W.W. and no it was not an internet URL 150 years ahead of time! W. W. Wright was the railroad superintendent. I found some more good stuff on my second visit including a complete set of employee timetables for the USMRR in Virginia including the O&A, Manassas Gap, Washington and Alexandria, AL&H, and the Falmouth line, though it was for 1864, not 1863. But I have the train sheets for Falmouth in 1863, so I know what trains actually ran. I photographed all the of the time tables. I now have copies of about 300 pages of original source text to study, and I only photographed a small fraction of what I saw. I cannot think of another 19th century RR that has as much documentation saved. I saw supply requisitions, telegraph traffic including many, many train orders, dispatchers log books, train sheets, timetables, conductor reports, engine mileage logs, pay slips, lists of materials on hand, depot reports and lots of misc letters about various issues including personal. One disappointment was I did not have time to read through the all Alexandria Dispatcher logs to see what evidence they had on the car float traffic. And it was too much to photograph (at least on this trip) The handwriting on these was not very legible and it would take several hours to wade through every report looking for clues. I did not find the dispatchers logs for Aquia. I did find some conductor's reports for trains from Aquia. They were filed as loose documents, and were time consuming to go through. None of the conductor reports for trains on the Aquia line that I saw (only about 6) listed any foreign road cars, but they did note the road name as a column, so some may have been possible. 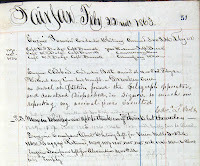 These were hand written forms, so it was up to the conductor to make the columns when he wrote the report. Sometimes they omitted the column for road name, but usually they did include it, even if all the cars were listed USM. So the issue of foreign road names on the Aquia line is still up for grabs. The Aquia train orders, in the form of telegraph traffic, I read (I read most of them and photographed about 20) indicated that there were passing sidings at Brooks and Potomac Creek as well as Stonemans and Aquia. May have to do some redesign on the layout to try to incorporate them. Falmouth had a water tank, but not at Stonemans, Potomac Run or Brooks. All of the locos on the Aquia line were named, not numbered. I have been compiling a list of what locos were present based on what showed on the the train sheets or train orders. Lots of cool details like these are coming to light thanks to this research. The process the National Archive uses is a bit cumbersome. You can't just pop in and browse, but it is in the interest of protecting these rare documents. I'll summarize the process here so if you come to town to do research you will hopefully be more efficient. I've been both to the downtown and College Park archives. The procedures are similar. The photos are at College Park while the text records seem to be downtown. The first step is learn when they are open and plan around those hours. While you can look at materials during open hours, the researchers only make "pulls" from the archives every two hours starting at 10:30 and the last at 3:30PM (check their website for actual hours). You will need a researcher's card to get access to docs. This is a 15 minute process as they make you read a powerpoint presentation about their rules and procedures. Then they take your picture and give you a card. Really not that big a deal, but if you are playing the clock close, you need to plan that in. The card is good for 1 year. To find material you search through their indexes. For military records you go to the downtown bldg, first floor room G28 IRRC. The staff are very helpful. The USMRR records are in record group 92, part of the quartermaster records. To get them to pull materials for you, you fill out a request. This is a paper slip that lists record groups and entry number. You'll get that info from the index. You submit your requests. The staff will help you cull the material requests to a manageable amount in case you ask for too much. Then you wait for the pull to be made, which can take about an hour or a bit less. To see the documents at the downtown location, you go to the second floor viewing room. At College park, you can wait in the same room. Once the pull is ready, they'll bring the documents to you. They have photocopiers available there, but some docs cannot be copied. The easiest technique is to use a camera to photograph them. If you use the copy stand you'll get excellent images. I visited the National Archives today to do some research on the USMRRs. I'll be heading back tomorrow night to do more research. I concentrated on the Aquia-Falmouth line, but ended up getting some very interesting information about Alexandria, and selected tidbits from Nashville and Chattanooga-Atlanta Line. I really hit pay dirt with respect to the operations on the Falmouth Line. I was able to find a listing of all cars received and forwarded from Falmouth for the whole winter of 1862-1863. The data includes engine name, conductors, cars delivered by number, contents and time of arrival and departure. This is incredible data to find for setting up operating sessions. I will analyze this data and post the summaries later. In the meantime, here is a sampling of some of the information I found. Some of the records appeared to have never been opened before. I was not permitted to open them until a conservationist could examine them. 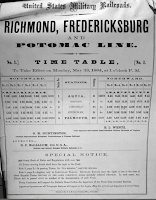 This image is a copy of the Dispatcher's Train Sheet, called the "Telegraph Register of Trains" at the time for Alexandria, VA. It shows a record of the trains that ran on the RR that day. 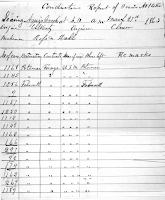 This sheet shows the lines radiating from Alexandria to Washington, Manassass and on the AL&S to Vienna. This is an important record, as it describes the traffic on the railroads for that day. It lists the locomotive, conductor, and train number for each train that ran that day. This information is invaluable for setting up a realistic operation session. I also got a copy of the Alexandria Car reports for 1862. For a modeler this report includes a list of all the USMRR car numbers present at Alexandria during this period. This is a blow-up of an entry for the station record at Fairfax Station. It describes an incident where the station agent and others were found to be intoxicated by the arriving train crew. I wonder how Haupt dealt with this? This is a record of foreign cars shipped over the Orange and Alexandria. I copied about 10 pages of this. My initial review of the data shows cars from at least four different railroads. So it seems that it was not that unusual for foreign road cars to be spotted on the USMRR. There is a lot of additional data at the archives to help address this question, but my guess based on a quick review of the data is that about 1 in 20 cars that arrived at the USMRR Washington Depot did not return the same day and may have been forwarded. This is a flyer printed by the USMRR to announce the sale of surplus railroad equipment at the end of the war. The next page gives a list of all the locomotives to be sold. Those interested in the City Point Army Line will find this set of files interesting. It is a record of trains on that line showing the stations and arrival times. The document I looked at only had data for March, 1865 but other books probably exist and should be investigated. I have organized the files into pdfs, but the files are very large ranging up to 450 MB for the Falmouth data. I will make these files available to those that are interested. But due to the their size, I am not sure how to go about it yet. Any suggestions? 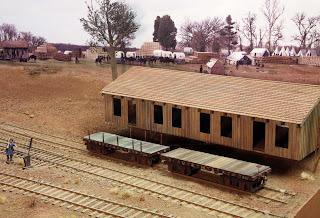 This photo shows the Falmouth Freight House in-progress. I used a piece of scale lumber to do the ridge cap. The shingles are laser cut maple with self stick adhesive, stained and painted to resemble cedar shakes. Installing the shingles was a little trickier because I used purlins instead of a flat roof sheeting. I had the roof removable, but that really wasn't necessary and it made the roof more difficult to build. I still need to add the doors, windows, platform along the tracks and some details. 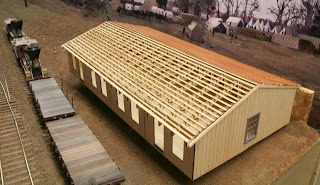 Here is a photo of a shingled roof from a structure at City Point, VA during the ACW. 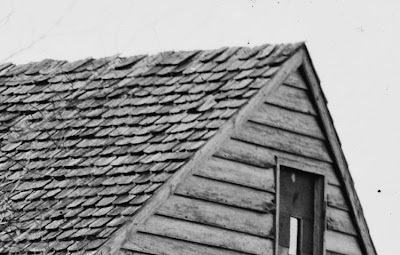 Note how the shingles meet at the peak. How did they prevent rainwater from entering? I don't see a ridge cap. Anybody know how this worked? 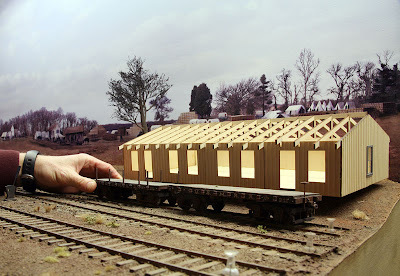 That's what my wife asked me when she saw the first O scale structure I started building for the layout. This will be the Falmouth Freight House. I don't have any photos of the actual Falmouth terminal, so I am using a building at City Point as an inspiration for the structure. 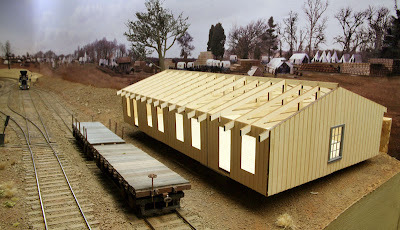 This is probably the main drawback of O Scale, the structures are really big. 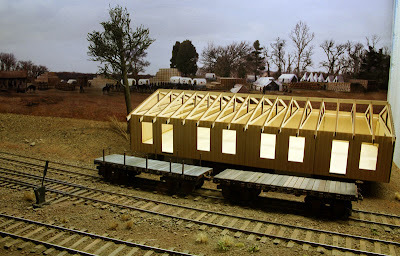 This gives you the opportunity to make a nicely detailed model, but they take up a lot of layout real estate. The overall size is 16 inches by 8 inches. There are 17 rafters. These I cut on the laser using 3/32nd inch basswood. They came out nice. The laser cut window holes are sized for Tichy castings. The doors will be scratchbuilt. The walls are Mt Albert milled basswood representing board and batten siding. I did not detail the interior walls with studs yet, but I do plan to. There will be a 1.5 inch wide loading deck in front of the building. Any suggestions on what color I should use to paint/stain the walls? The color of the ground work and backdrop looks very different in the photos, but in person the colors match pretty well. I'm not sure what is going on there.